Words from the Fire, win a free copy of Al Mohler’s new book. In Words from the Fire, Dr. Mohler expounds the 10 commandments for us. Moody publishers provided me two copies of this book: one for my review and one to give away. So, thank you Moody for the opportunity to review this great book and for providing one for this giveaway. I also ask that you subscribe to this blog and if you use twitter, follow me before entering this drawing. Please enter by Sunday, September 27th. The winner will be drawn Sunday, September 28th. If the winner does not respond with a shipping address within 2 days a new winner will be drawn. 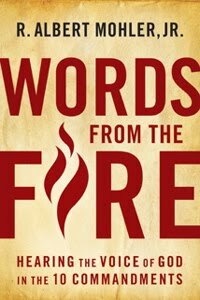 Previous post: Words from the Fire, by Al Mohler, a review.